Since last week, I have been trying to sort through and compose all of my fragmented thoughts into a coherent blog post. I’m not sure that I’m quite there yet, but here’s a try. Once you whole-heartedly commit to bodybuilding, you experience a shift in your thinking and ultimately your body will transform into another entity. “Whole-heartedly,” means not just consistently working out inside the gym, but more importantly, taking responsibility for your actions at home in the kitchen, in the grocery store, during your lunch breaks at work, at family and friends homes, the local convenient store, and while sitting at the table dining in restaurants. It means committing to educate yourself on every aspect of developing and improving your physique. Want better…Learn better…Do Better… It’s an ongoing and never-ending journey. Deviation away from the model is, well– less than 100% committed. There’s no critiquing here– I am simply putting the truth out there. In terms of fitness goals, you set your own goals. What you put into it is exactly what you are going to get out of it. The process is not as complicated as people make it. Most people want it but are not willing to do what is required to get there and it’s okay if bodybuilding is not for you. But if you really want to get in shape, the commitment is the same. Forget all the crazy quick fix programs out there, because they are not lifestyle changes. They’re a band-aid; a temporary fix. Eventually you will return to your old habits if not worse. Okay.. enough of my tangent. I brought up the topic of “change” first because I am still flabbergasted by how bodybuilding has sculpted my 49 year-old body. If you are new to my page, this was my second figure competition. May 2014 was my first. I swore to myself that I would be a “one and done” competitor; however, I was wrong. My friend, who has and continue to help me reach my fitness goals, told me that I would do it again. Ha! She was right. So this second go around was different from the first show. After my first show, I continued training. The weight training, particularly, has become an extension of my lifestyle. I have worked out all my life; running, aerobics, martial arts, and CrossFit (which I still love!). Healthy living has always been a part of my life, but weight training has elevated my game. Lol! I love the results. My decision to compete came about some time in December ’14 and only after nudging from my friend. I figured, since I was already training, why not just do the show. The show was close to home and smaller than the Brick show. The mechanics of how the body changes is an amazing process. My first show was all about getting stronger so I could lift heavier and build muscle. I never stopped training after the Brick show last year, so the strength was there and I could lift heavier. On average, working around my son’s basketball schedule I trained three to four days per week; occasionally hooking up with my friend. The last two months, I worked out more like five days a week. The week before the show, was hell! Yes, I said it! Lol! I weighed more going into it this time, which is good. However, to lean out I had to make two dramatic changes. During regular training, my daily caloric intake was 2400-2700. By the week of the show, my caloric intake reduced to 2200. Please don’t mimic this. Every human body is different. What works for one person probably will not work for another. This regime was completely different from my first show. So what made the last week so ugly? Every morning after using the bathroom, I weighed myself, while hoping and praying I dropped at least a pound. Chile, this isn’t my normal! I rarely get on a scale. My clothes pretty much tell me how what I weigh. If my pants are tight, I gained weight, if they’re lose, I lost weight. I didn’t like the anxiety that came along with the anticipation of meeting a “weight” goal. Ugh! I did cardio before work at 4 O’clock in the morning and after work! “Cardio” consisted of 20 minutes of HIIT (High Intensity Interval Training). What’s this? Something like…. 25 jumping jacks; 10-15 push ups; 30 seconds of mountain climbers, planking then repeating the exercises for several rounds. I also used the treadmill: Walking on an incline for a minute or two; running for a minute at a speed of 6.0, and then walking with no incline for a minute–then repeat. Everyday I ate the same meal, chicken and spinach, every three hours: 6 a.m., 9 a.m., 12 p.m., 3 p.m., 6 p.m., and 9 p.m. I was so darn tired of eating chicken and greens, I actually dreamed, maybe hallucinated, about eating ribs. Hahaha! And I don’t even eat ribs, but I did in my dreams. Oh yeah… You wanna know the worst part? The damn chicken was NOT seasoned; neither was the spinach. 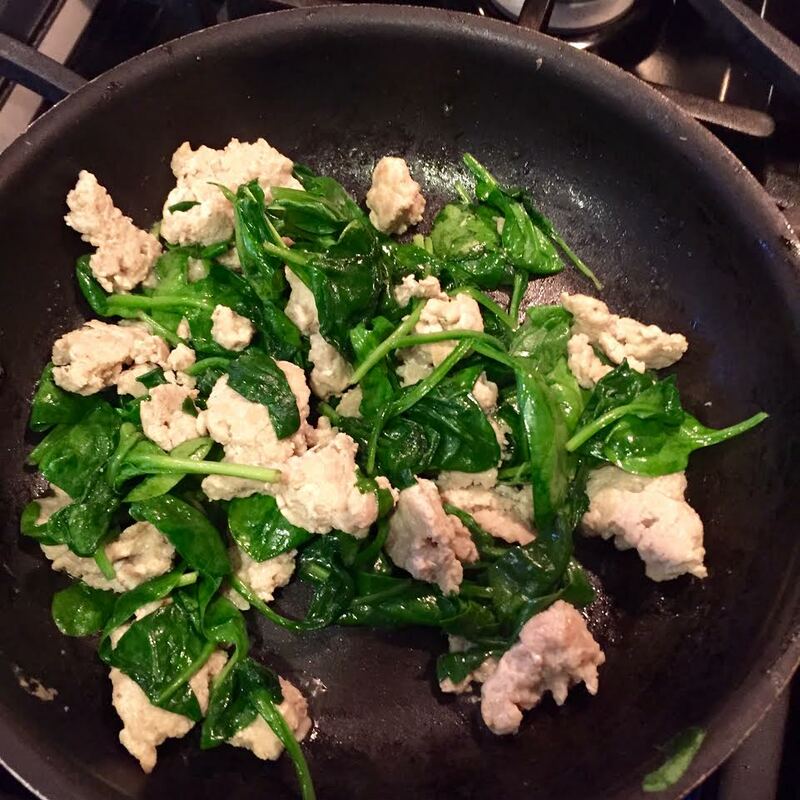 The bland spinach was okay, but the chicken– well you can imagine. Half way through the week, I squeezed fresh lemon juice on the chicken; that helped a teeny-weeny bit. I don’t mean to gross you out, but when I pooped… that was dark green too!! TMI (too much information).. I know. I learned that water is a natural diuretic, which is why I drank so much of it. At one point, I was drinking two liters daily, but closer to the end of the week, I slowly decreased my water intake. My body was literally under construction. The cool thing is that everyday I saw subtle changes in my body. My abs started coming through, and the muscles that I worked so hard to develop became more evident. Note: When you see photos online and in magazines of professional body builders, they have leaned out for the sake of the photo shoot. Most bodybuilders do not walk around perfectly cut everyday. Nearly every day, I practiced posing in the fitness room at the gym. To critique my body positioning, I wore super short shorts and a sports bra. You’d think I would be comfy with my body, but I was still aware of the guys who walked into the room to do crunches, to hit the bag or something else. I learned to not care if they were watching. Wearing my ear buds, I’d “turn up and tune out” turn up the music and tune them out. Lol! Occasionally I’d peep folks standing on the outside looking in! I struggled with song selection. During the show/competition and after “pre-judging” each contestant is given the opportunity to strut their stuff for about 30 seconds. You can get very creative with this segment. Small props can be used along with your favorite music. While I had trouble coming up with ideas, my friend gave me a couple of cute ideas, but time and confidence was not in my favor, so I stayed with the basics. The day of the show, I woke up refreshed, but guess what? Since I was only privileged to a “sip” of black coffee with no sugar, I skipped it. I think I had like two ounces of chicken and a rice cake or two. Then the same thing a few hours later. Haahahahah! I did talk about commitment right? Actually, this wasn’t bad. I was too busy trying to get my belly button re-pierced. I think my friend hit the roof when I told her that on my way to the competition I was going to the parlor to get it done! OMG!! Rightfully she was concerned about possible swelling or irritation. My previous piercing got infected from the spray tan and closed. I’d been meaning to get it redone, but… well, you know, my time is limited. Anyways, I got it done. I just had to have my belly ring for the stage. Thankfully, I didn’t have any problems. 🙂 If you want something, go for it. I arrived at the show and we (men and women) were jammed into a small room, where hair, make up, and muscle pumping took place. Although the event is a competition, most competitors are friendly. I think there’s a deep level of respect because we all put the work in and made similar sacrifices. Funny, I was the only black chick in this show. The show in Brick, NJ last year, had a hand full. For whatever reason, we’re few and far between. It doesn’t both me tho. The first show I attended, as a audience member, I noticed that that there weren’t any women of color on stage– that is one of two reasons I decided to do it. The other reason was out of pure curiosity of what I would like after training. Now I know! Hehe! Walking on stage felt so good. I could hear my husband and friends in the audience cheering me on. Talk about feeling empowered. I did have a hiccup tho. I brought the wrong CD so I had to walk on a different song. It wasn’t a big deal because my attitude as it relates to stage presence was in my head not in the music. With that said, you bet it won’t happen again. I placed second in Figure, Open B. Due to the number of figure competitors, we were split into Group A and Group B. I was in Group B and placed 2nd. The top two winners in Group A & B competed; I placed 3rd in open. I was shooting for 1st in open. I would be lying if I didn’t tell say that I was disappointed with my results, however disappointment is good for me. Disappointment has made me assess all of the photos, mine and my competitors. 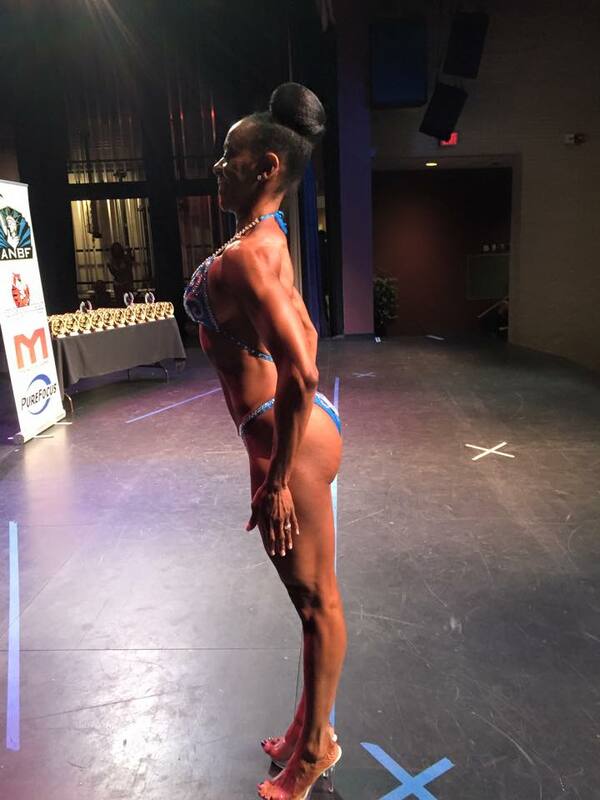 I critiqued my poses, my walk, and my muscles to the T and know exactly what I need to do for the next show. On the brighter side, I competed with and held my own against women who were much younger than I. Now that sh** felt good! Lol! Equally as awesome is that many of these women are moms with kids. One gorgeous competitor has five kids! Isn’t that wonderful!! These women are empowered to care for their family and spouses, but also find time to engage in an activity that is important to them, which is what we all should be doing. Don’t put your entire life on hold for your family; that’s ridiculous and, in the long run, you won’t be happy. You think you will, but you won’t. You’ll find out… maybe years later. Carve time out for yourself. If you’re a mom and or wife, you will become a better person for doing so. Life is short. Yeah I know that’s a cliché, but it’s true. My favorite picture from the competition. This entry was posted in Family Living, Fitness, Hair Natural, Healthy Eating, Healthy Living, Inspiration, Uncategorized and tagged Almost 50, ANBF, Bodybuilding, commitment, courage, disappointment, figure competition competitor, fit black chick, Fitness, fitness goals, get in shape, Healthy naturalista, lean out, lose wieght, mom with kids, muscles, natural hair, over 40, posing practice, weight training, win, workout. Bookmark the permalink. You did great girlfriend! You should of placed first! Tanya that picture from the competition is giving me life! You did it! You earned every award! You prove hardwork does pay off!